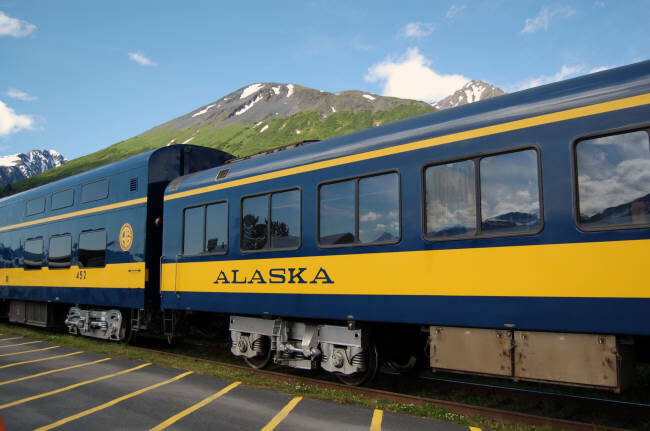 Alaska Governor Mike Dunleavy is asking President Donald Trump for permit needed to connect new 200 miles of Alaska Railroad to tar-sands oil fields in Canada, and Lower 48, supporting A2A, Alberta to Alaska Railway Development Corp.'s $17 Billion project by Sean McCoshen. By Alex DeMarban, ADN, April 1, 2019. Conventional Railroad in North America: 1,767 miles (2,844 km) . From Cape Prince of Wales (Alaska, USA) - Fairbanks (Alaska) - Whitehorse (Canada) - Fort Nelson (Canada). Further connection to Seattle by existed railroad owned by BNSF Railway . Conventional Railroad in Asia: 2 ,392 miles (3,850 km) . From Uelen (Chukotka, Russia) - Egvekinot - Zyryanka - Ust-Nera - Yakutsk. Further connection to existed Russian rail. Second, 2,400-mile (3,862 km) high-speed rail from Edmonton - Chicago - New York. 1. Link to China. About 3,000 miles (4,828 km) . From Uelen (Chukotka, Russia) - Egvekinot - along Russian Far East to Heilongjiang Province in China. 2. Link to Russia and Europe. About 3,000 miles (4,828 km) . From Uelen (Chukotka, Russia) - Egvekinot - Zyryanka - Ust-Nera - Yakutsk - Krasnoyarsk (Russia). Further connection to the future Russian high-speed railroad Krasnoyarsk - Ekaterinburg - Kazan - Nizhny Novgorod - Vladimir - Moscow constructed by JSC High-Speed Rail Lines (Russia), and to the European network of high-speed rail Eurail via Berlin (Germany). BERING STRAIT TUNNEL CONSTRUCTION - up to $35 billion. Total, a double-track conventional railroad from Yakutsk (Russia) to Fort Nelson (Canada), including the Bering Strait tunnel: up to $250 billion . Alaska - Edmonton (Canada) - Sacramento (CA) - up to $370 billion . Edmonton (Canada) - Chicago - New York - up to $240 billion . 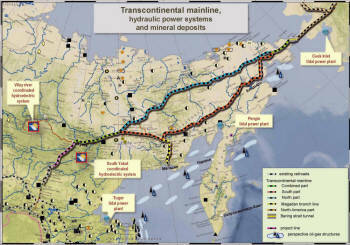 Asian railroad (link to Russia) - up to $450 billion (average $150 million per mile). Asian railroad (link to China) - up to $240 billion (average $80 million per mile, mostly build and financed by China). - plus hundreds of thousands of jobs will be generated after the construction. The construction of a development corridor extending 50 miles (80 km) on each side of the railroad, can transform the regions in Canada, Alaska and Russia in its entirety. Power lines, fiber-optic lines, and where necessary, freshwater pipes would be encased within the corridor. Cities, population, manufacturing, and scientific agriculture would be fertilized and harvested in this corridor as well. - Up to 100 million tons of freight traffic, or 8% of world freight cargo each year between Europe, Russia, China, Japan, South Korea, Canada and USA, as well as supplying minerals and electricity between USA, Canada, Russia and China. - High speed trains running through the Bering Strait would allow uninterrupted travel at 250 miles/hour (400 km/hour) from Europe's Atlantic coast to California and New York. ■ The project will actually involve construction of three parallel tunnels under the Bering Strait connecting the U.S. and Russia, along with sections of railway linking to the rail systems on each of the two continents. ■ Both of the two main tunnels (each not less than 54 feet / 16.5 meters outside diameter, 49 feet / 15 meters inside diameter) will accommodate two-way traffic between Alaska and Russia. Both tunnels will also include two levels of traffic: the bottom part will have a railway for slower moving cargo and passenger conventional traffic; an upper level will include space for high-speed rail trains, one or two lanes for automobiles, and additional space for a future Airless Maglev Tube Transport system (at speeds of up to 4,000 miles per hour). Still other space at the right and left "corners" of the bottom level will be used for water, gas and oil pipelines plus electrical and fiber optic cables. ■ A third tunnel (23 feet / 7 meters outside diameter, 18 feet / 5.5 meters inside diameter), built between the two main tunnels, will provide emergency access corridors to each main tunnel at regular intervals along the entire route. It will also house a road for use by emergency and maintenance vehicles. ■ The length of each tunnel will be about 74 miles / 132 kilometers or more, which includes the width of the Bering Strait (64 miles / 103 km) plus a distance not less than 5 miles / 8 kilometers inland on each coast. This will result in better access for trains utilizing the tunnels. ■ Completion of the entire project will take 12-15 years, at an estimated cost of $35 billion. ■ Excavation of the undersea tunnels will produce crushed basalt gravel (approximately 55 million cubic yards / 50 million cubic meters) which can be used in the construction of railway beds extending beyond each end of the tunnel. The quantity of this gravel product will be sufficient to lay a rail bed 6.5 feet (two meters) deep at a width of 23 feet (seven meters), extending over 2,175 miles / 3,500 km in length. This will cover the distance from the Bering Strait to Canada in America and much of the necessary access railway in Russia. (Russian rail beds in this region require less gravel because they cross rocky areas less affected by permafrost. ■ This gravel by-product also explains why project construction should start with the tunnel portion. Moving the resulting crushed stone from the tunnel excavation site along future access rail beds will keep down the cost of their construction. ■ Construction will go on 24 hours per day. The tunnel workers will be laboring around 100 feet (30 meters) below sea level in an environment with a steady temperature of 77-86° degrees Fahrenheit (25-30° Celsius). The cooling system inside the tunnels will not therefore require air conditioning (a big savings!) because cool air can simply be vented in from the outside. 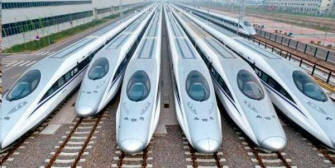 ■ If equipped with high-speed trains run by magnetic levitation (with speeds of up to 300 miles per hour / 480 km per hour) they will be the first use of such technology for profit. Tourists will be able to cross between the U.S. and Russia in just 15-20 minutes. ■ Where the tunnels pass under America's Krusenstern Island (Small Diomede), a railway station can be built allowing passengers elevator access to the island. A world-class hotel would provide them with a mid-Strait vista of the confluence of the Pacific and Arctic Oceans. A stay at this iconic hotel, along with a journey on the magnetic levitation train serving it, will become a tourist attraction in its own right. 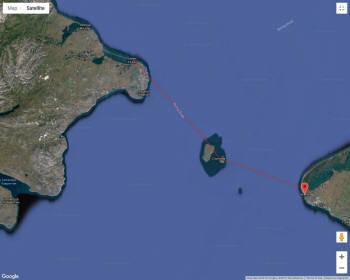 A similar facility can be created on Russia's neighboring Ratmanov Island (Big Diomede). Read more about the Bering Starit tunnel plan. 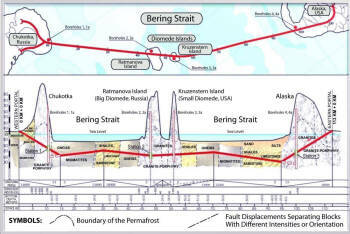 Plan for new railroads in US (state of Alaska), Canada, Russian Federation (Siberia) and China, and a tunnel connection between them under the Bering Strait. See more maps and read the stories about this project. "The Bering Strait rail and tunnel project can help enhance and expand prosperity for the 21st Century by linking the world's greatest industrial nations with the vast untapped mineral resources of the Arctic. To the south of Alaska and Canada, stands the continental United States, with the greatest economy on Earth, and it too badly needs resources. Building a corridor, linked across the Bering Strait, will provide access to our Arctic resources of oil, gas, precious minerals of all kinds, and freshwater. This vital link will greatly enhance the prosperity of the world. I've supported connecting the continents by rail. This is going to change the world, and it is easy to do. All it takes is a decision." 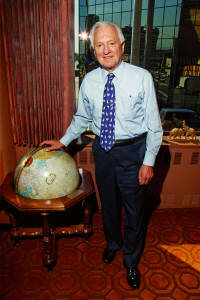 Walter J. Hickel was twice elected as Alaska's governor, serving as the state's second governor, 1966-69, and again in 1990-94; he served for nearly two years as President Richard Nixon's first Secretary of the Interior (1969-70). Source. Some interesting facts and data regarding the proposed construction of a Bering Strait Tunnel linking the conventional railroads and high-speed railways of North America, Asia and Europe. 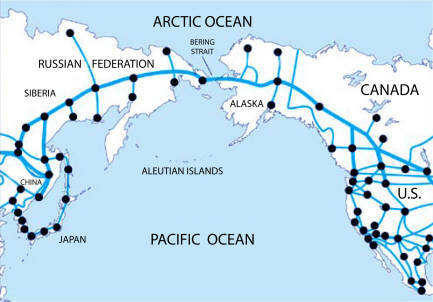 The dream of an interhemispheric rail connection linking America with Asia across the Bering Strait remains as visionary now as when first proposed a century ago. The opening of the Channel Tunnel connecting Britain to the European continent has made it even more so. This monumental European achievement highlights both the global challenge we face and the vast potential in opening our own secure new avenue for trade and communication between three great nations - America, Canada and Russia - and other Pacific Rim economies. The recent disruption in air transportation caused by the Eyjafjallajökull Volcano in Iceland likewise demonstrates the unreliability of air links and the desirability of land based trade connections. If the planning, construction and utilization of an Interhemispheric railroad connecting Alaska and Russia across the Bering Strait could be launched merely by a chance meeting of leaders, a simple handshake, and the words "Let's do it!" - it would be truly historic. But in reality, major development projects on this scale come only after much preparation by others dedicated to an enlightened economic vision - and by private investors prepared to recognize opportunity and grasp it. Consider, for instance, what it took to accomplish the 31.4 mile undersea rail Eurotunnel across the English Channel (la Manche, in French) between Britain and France. Construction on this now acclaimed project started in October of 1990 and the tunnel was finally opened for rail travel on May 6, 1994. But all this was preceded by much hard work overseen by two financial and construction groups from the British and French sides. In 1985 they had formed the Channel Tunnel Group/France-Manche (CTG/F-M). Before that, local banks and construction interests had joined together to lobby for the tunnel based on a 1975 study which included eleven volumes of supporting materials. Of course, since 1957 Britain and France have been partner nations in the European Union and its predecessor. There is at present nothing approaching that level of cooperation between the United States and Russia. At times there indeed seem more issues that divide rather than unite us. But a railroad connecting our two great countries could be vastly profitable for both and speed the movement of cargo and passenger traffic. This would also make available rich mineral deposits and put new perspective on the need to get along more harmoniously. Something far removed from the old Cold War climate. Russia could sell its abundant gas and oil to North America, adding new and convenient resources to our energy marketplace. Also, for Russia, getting fees for transit cargos from China and the rest of Asia would be lucrative. But perhaps most importantly, economic growth would take place along new and existing railway lines in eastern Russia - with new infrastructure and an expanded labor force serving the rail network. Towns on both sides of the Bering Strait would grow along with new service companies and international joint ventures. While all this would make for economic growth, it would also help right the historic imbalance of power between Moscow and the far eastern region of Russia - something which could in itself greatly benefit free trade. As coastal jurisdictions opt to adopt policies which benefit their populations, the Moscow government would come under increased pressure to relax its trade policies. 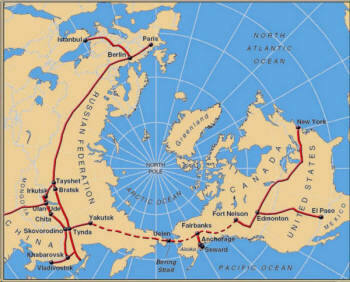 In August 2011 the Intercontinental Magistral Eurasia - North America (conference) held in the Russian city of Yakutsk agreed, without delay or even a signed agreement with the United States, to connect the existing Russian Baikal-Amur railway to the Bering Strait. This will involve laying 2,400 miles of rail through undeveloped regions of Siberia to the Chukotka Peninsula by the year 2030. Separately, and at the same time, an undersea Bering Streat tunnel could be built from American side or from both sides to extend the rail lines between Alaska and Russia. "We also have impressive plans to further develop railway services in the North, which we hope will come true in the coming decade," said the Russian president. 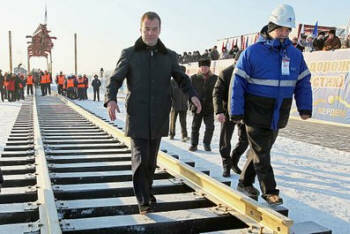 Medvedev mentioned at the ceremony that once a railway crossing is built over the Lena River, the rail line will reach to Yakutsk while another line will run from Nizhny Bestyakh to Magadan and then on to the Bering Strait. "The crossing will be built by all means. Have no doubts about that," he said. The railway project in Russia is being financed with state funds and is managed by the joint stock company Russian Railways - though details haven't been announced. For the United States, Russia and Canada roughly 5,500 miles of new railroads would need to be built, with the tunnel itself, at an estimated total cost of perhaps $100 billion or more. In comparison, this is a fraction of the Iraq War cost. The entire cost of an undersea Bering Strait tunnel project would depend on many things, of course. The final bill for the tunnel between Britain and France, for instance, was 80% over initial estimates; in current prices that would be $17.5 billion. 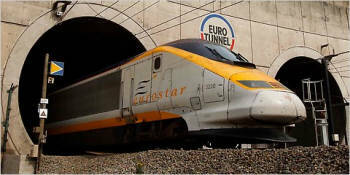 But in the case of the Eurotunnel both governments had extensive networks of inland railroads, so the major need was a connecting tunnel. And while in Russia it does not seem to be a question of who will handle the financing, a weak U.S. economy combined with tepid interest in Canada means that finding money to build the North American section of the international railroad could be an issue. This is why we formed the InterBering LLC, The Bering Strait Tunnel Construction Investment Company and established this website. 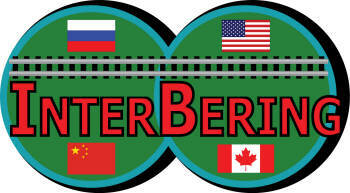 We at InterBering believe that the entire Bering Strait Tunnel project can be financed through private funding, without the financial help of central governments. This is in fact the way the Eurotunnel was built. With approval by local territorial governments - if not those in Washington and Ottawa - sufficient money could be found through private investors. In reality, the planning, construction and utilization of an Interhemispheric railroad connecting Alaska and Russia across the Bering Strait will be launched only after much preparation by those with enlightened economic vision - and by private investors prepared to recognize opportunity and grasp it. Progressing step by step, we intend to first establish an office in Anchorage where local governments, construction concerns and finance groups can work together to achieve the higher level of communication necessary. Moreover, in our view the United States and Canada could build a railroad to the Bering Strait several times faster than the Russians will do it through their completely undeveloped Siberian lands. This is because it is possible to initiate North American construction from different places at the same time: from the existing Alaska Railroad in Fairbanks simultaneously in opposite directions (and the construction of a southeastern 80-mile railway from North Pole to Delta Junction with a near a mile-long bridge over the Tanana River is already underway), and from Fort Nelson in Canada to the north. Coming to the shores of the Bering Strait 10-15 years earlier than the Russians, at the same time we could go on to build the entire tunnel (about a 12-15 year project) with our own financing and labor force, including the portion on Russian territory. That could potentially give us more control over key aspects such as tunnel maintenance, security, customs and operation schedules - including the possibility of controlling land on the Russian side to house workers, etc. U.S. Congressional interest in taking over from InterBering, LLC the construction of the project could follow, as the many economic benefits become readily apparent - including the hundreds of thousands of new American jobs the project will produce. Building new conventional rail lines and high-speed railroads that run at 280 miles per hour, plus producing the steel, cement, copper and aluminum wire, power plants and many other necessary components will involve a vast number of workers. Alaska will benefit from a through rail connection linking the continental U.S. and Asia because such a railroad will not only help end the isolation of our largest state but will give it increased opportunities to ship liquefied natural gas and oil to vast new markets - and to do so by train rather than by enormously expensive pipelines. The Alaska Department of Transportation might become the single biggest supporter of building a transcontinental railroad. And just as with the Suez and Panama canals, the country or countries who design and build the Bering Strait tunnel will be the ones who control its traffic, cargos and travelers. This adds a strategic consideration which cannot be overlooked. As one of the greatest civil engineering projects in history, this Interhemispheric North America-Eurasia railroad could also usher in a new era of American and Russian cooperation. The moment at which American and Russian workers drive in the final spike will be as significant to the world as that World War II moment 71 years ago when our armies linked up across the river Elba in Germany to end a war. Presentation (PDF) of Eurasia - North America Rail Link and Bering Strait Tunnel Project at the International Conference in Yakutsk, August 17-19, 2001 by Viktor Nikolaevich RAZBEGIN , Deputy Head of Deputy Chairman of the Council for the Study of Productive Forces. no-fly zone in Europe, Russia and North America after Eyjafjallaj ökull Volcano eruption in Iceland in April 2010. Crossrail tunnelling began in May 2012 and ended at Farringdon in May 2015. 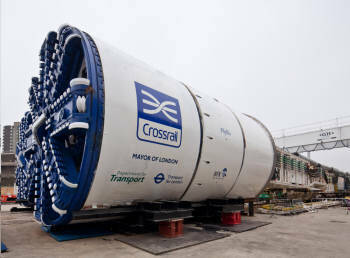 Crossrail used eight 1,000 tonne tunnel boring machines (TBMs) to construct 26 miles (42 kilometers) of new 6.2m diameter rail tunnels under London for Elizabeth line. "Our airports, bridges, water tunnels, power grids, rail systems ̶̶ our nation's entire infrastructure is crumbling, and we aren't doing anything about it. Our infrastructure is terrible, and it's only getting worse and more expensive to fix. The Chinese build new cities in about 12 minutes, while we take years to get the permits to add a dormer window to our own homes. Fixing our infrastructure will be one of the biggest projects this country has ever undertaken. Before we build bridges to Mars, let's make sure the bridges over the Mississippi River aren't going to fall down. There is nothing, absolutely nothing, that stimulates the economy better than construction". Book Excerpt: Donald Trump's 'Crippled America: How to Make America Great Again'. The President has dedicated $200 billion in his budget for infrastructure that can be leveraged for a $1 trillion investment into our crumbling systems. Investing in rural infrastructure is a key part of the President's plan. New High-Speed Train from China to US? "Russia needs us to help with their economy, something that would be very easy to do, and we need all nations to work together." Authors: George Koumal, Joseph Henri, Scott Spencer. Anchorage Daily News, January 24, 2019. Planned Russian Transcontinental Railroad Development to 2030. Hydraulic Power Systems & Mineral Deposits. The 65-mile (105 km) Bering Strait tunnel pass under both Little Diomede (USA, right) and Big Diomede (Russia, left) Islands which could be sited ventilation shafts and other facilities. The tunnel connects Wales (Alaska) and Uelen (Russian Chukotka). 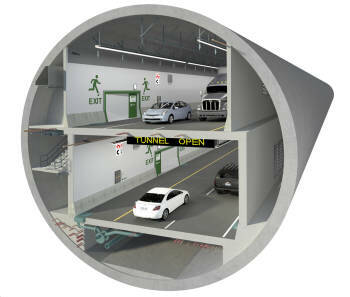 Seattle's new SR 99 tunnel is the largest double-deck highway tunnel of its kind in USA. The same-size tunnel can be built under the Bering Strait for the railroad traffic.